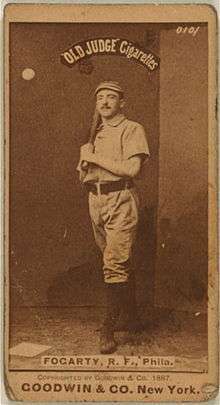 James G. Fogarty (February 12, 1864 in San Francisco – May 20, 1891), was an American professional baseball player. He played as an outfielder in Major League Baseball from 1884 to 1890. Fogarty played for the Philadelphia Quakers of the National League and was a player-manager for the Philadelphia Athletics of the Players' League. An alumnus of Saint Mary's College of California, Fogarty died of tuberculosis at the age of 27  in Philadelphia.